Grammarly was founded with the mission of using technology to help people say and write what they mean. More than ever before, our products can help people achieve their goals with confidence in their communication skills. 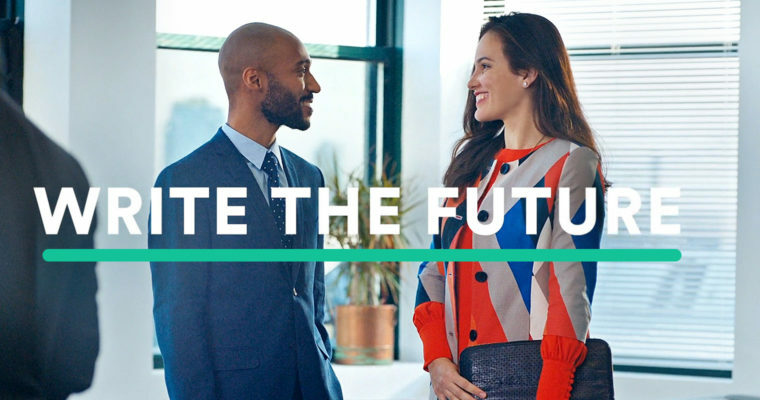 In the second installment of our “Write the Future” ad campaign, we show how seamlessly Grammarly’s products integrate into your everyday life and allow you to focus on clearly delivering your messages. Oftentimes, it’s how you communicate that gets you to your desired goal. Our new ad campaign pays homage to our customers, who accomplish amazing things and forge remarkable paths with Grammarly by their side. “Write the Future” is a shift to putting storytelling and relatable characters in the foreground and our product in the background. The scenarios that play out are breakthrough moments for the characters, including a best man, who seeks to tell the perfect story in his wedding-day speech, and a student, who works up the courage to write something bold and pursue a future in journalism. They represent the feedback from our millions of passionate customers, who share their writing triumphs and communication challenges with us on our social media channels. Developing a brand campaign for a company that’s all about communication is a challenging but rewarding experience. It’s filled with hours of planning, writing, producing, filming, editing, and numerous other logistical details of filmmaking. After a few weeks of detailed edits and feedback loops, we’re proud to unveil the final cut. We hope you enjoy — and we encourage you to write your future with Grammarly.